Ekaterina Sokolova (b. 1983 in Syktyvkar), poet. She graduated from the Department of Philology of the Syktyvkar State University. 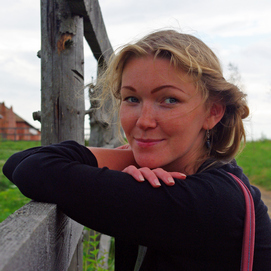 Ekaterina Sokolova is the author of four books of poems. Her poems are translated into English, Italian, French, Serbian, and Latvian. Poems translated into Italian were published in such anthologies of contemporary Russian poetry as “La massa critica del cuore” (2013) and “DisAccordi” (2016), and were included in the play, “Il cielo bianco sopra Youcali,” in San Marino (2017). A winner of the “Moskovsky Schet” Award (2014) and the Debut Literary Award (2009), she was also a finalist for thr LiteraturRoentgen Award (2008) and was short-listed for the Andrey Bely Award (2016). She lives and works in Moscow.